Christmas is just about a month away and it's time to get those Christmas cards mailed, if you haven't already. Yeah, I need to get on that!! I do like a bit of bling and shimmer on my cards and this Gift Giving image from Stampendous made it easy to add just the right amount sparkle. 1. Stamp Gift Giving on white cardstock with black ink and color with watercolor pencils. 2. Sprinkle Shabby White Embossing Enamel at the bottom of the image, use a small brush to wipe off of the image and heat emboss from underneath, so the embossing enamel doesn't blow off. 3. Sponge the top with blue ink, glue to a red panel and tie the left edge with gold cord. 4. Pop up on a green card, then place a strip of Sticky Panels below the image and sprinkle with Gold Micro Fine Glitter. The bits of gold on this card are just perfect. I really like to see what you ladies come up with, because I get new ideas that I never would have had if I hadn't seen them. You are so talented. Thanks for the ideas! Such a sweet card! Love this image! Beautiful coloring! I need some of that shabby white embossing enamel; it's gorgeous! 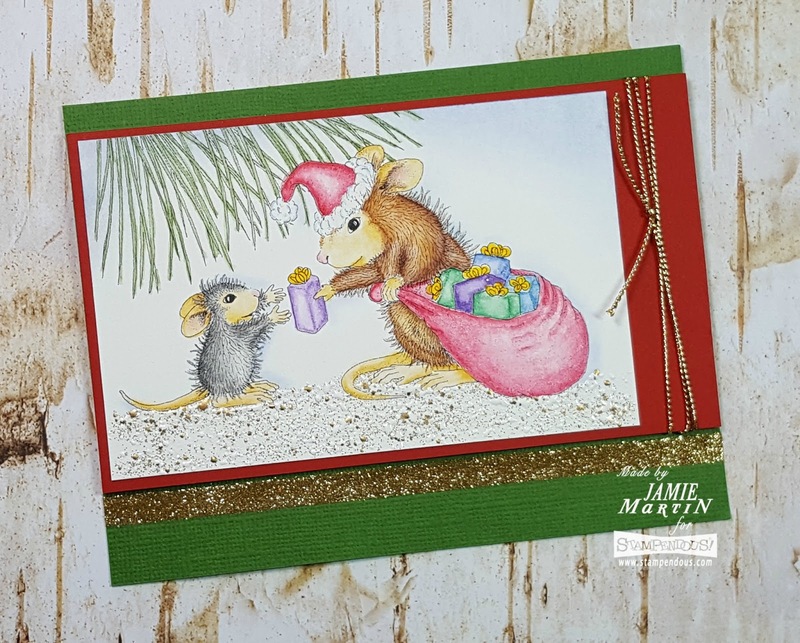 Your coloring is awesome and love the lovely design of this card.